A melancholy and very beautiful arrangement of an original tune titled “The Removalist” begins with Curtis Lundy’s big bass sound out front and prominent. Then Victor Lewis joins on drums. 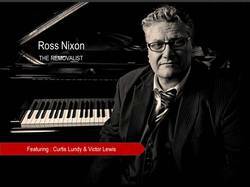 They set the groove and the rhythmic trampoline is established for Ross Nixon’s piano fingers to jump upon. This is a Nixon composition and one of six original songs on his CD. The delightful old standard, “Crazy He Calls Me” is beautifully interpreted by Ross Nixon as a dreamy ballad. “The Take Down” races off his Compact Disc with energy fused by the masterful drums of Victor Lewis and Curtis Lundy is pumping his bass in a fast-stepping walk. Nixon cuts-time across the rhythm path and dances atop the speedy arrangement, sometimes letting his fingers fly to express improvisational creativity and joy. When Victor Lewis takes a solo, it is exciting and technically astute. Here is a premier recording for this Australian pianist that is well produced and a lovely listening experience. It can be found on CD Baby. Sample Track from up coming cd - "The Removalist"